Ruby Jimile Moser, 83, passed away Wednesday, June 14th 2017. 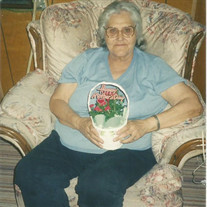 She was born August 3rd 1933 in Izard County, Arkansas. She was of the Pentecostal faith and a member of Cave Creek Church of God. She enjoyed reading her Bible and time spent with her family, her kids, and her grandkids. She was preceded in death by her parents James Johnson and Allie (Hall) Johnson; her husband Tommy J. Moser; one son, Tommy Ray Moser; three grandsons, Glen Russell, Steven Moser, and James Moser. She is survived by ten children, Sandra Worthen, Robert Moser and his wife Janet, Joyce Armstrong and her husband Allen, Rita Crouch and her husband Cornelius, Wanda Tosh and her husband George, Perry Moser and his wife Mary, Randy Moser and his wife Tanya, Laurie Barnes and her husband Shawn, Angie Barnes and her husband Kevin, and Jimmy Moser and his wife Amanda; one sister, Edith McCracken, 32 grandchildren; 39 great-grandchildren; and five great-great grandchildren. Visitation will be Friday, June 16th from 6-8 PM at the Willis Funeral Service Chapel. Funeral Service will be Saturday, June 17th at 11 AM at the Cave Creek Church of God with Bro. Eric Downs officiating. Burial will follow at the Barnes Cemetery near Bethesda. Pallbearers include John Moser, Josh Moser, Allen Ray Armstrong, Kevin Scott, Perry Jr. Moser, Bobby Moser, and Matthew Moser.